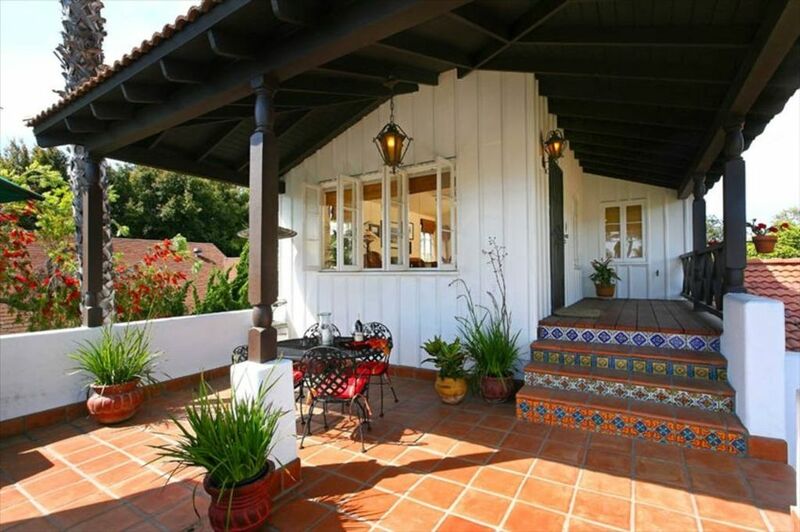 Charming Spanish Casita located in the Village of La Jolla. Walking distance to world famous La Jolla Cove, beaches, shopping, art galleries, museums and restaurants. The Casita/Guest House has 1 bedroom, living room, full bathroom, kitchenette with new microwave, coffee maker, sink, induction cook top, compact refrigerator. There is a large patio/deck with a new Viking grill, freezer, outdoor heater and outdoor table, lounge chairs and 3 market umbrellas. The bathroom has been remodeled recently with Marrakesh Tile flooring, a new vanity with marble counter top, new shower / tub with new shower head and fixtures. The Kitchenette has also been upgraded with a Quartz counter top, new sink and faucet. The property is located at 7701 Ivanhoe Ave East in the Village of La Jolla. The location is in a very upscale residential neighborhood that is easy walking distance to all that the Village of La Jolla has to offer (Beaches, restaurants, museums, art galleries, night life, shopping). For those that may be sensitive to noise we have an Adaptive Sound Sleep Therapy System that has 10 soothing settings such as Ocean Waves, Rushing Brook, Rainfall, Crackling Fireplace, Crickets in a Meadow, etc.. which will allow you to sleep comfortably. 1 Bedroom with a Queen size bed, full bathroom. Kitchenette has a coffee maker, new microwave, sink, new induction cook top, compact refrigerator, rice cooker, toaster and blender. There is a Desk in bedroom with wireless internet. Original artwork and paintings by local artist Fay Richert. Living room has a new European Style Queen Size Sleeper Sofa , new carpet, 2 large leather couches and leather chair with ottoman, Dish Network internet compatible HDTV , DVD player. The entire suite with bedroom and living room is approximately 600 sq. ft. Original art work by local artists. Large patio deck has Spanish pavers (400 sq. ft. approximately), new Viking grill and table with 4 chairs for relaxing after a day at the beach. There are 3 large umbrellas and outdoor propane gas heater to make sure you are comfortable regardless of the weather. The location is 3 blocks from world class shopping, restaurants, art galleries and museums on Prospect St. and Girard Ave. Beaches, Scripps Park, The Seal Rookery, and the Cove are all within easy walking distance. We provide 2 beach chairs, beach towels and cooler for your use while staying at the Casita. Yvonne & Eric had the perfect accommodation for our short stay in La Jolla. Everything we needed to make our meals when we needed or to take the short walk to the many restaurants and shopping in beautiful La Jolla. Location is perfect. Casita is everything you need. We will definitely come back again. The hosts were there for everything we needed. We had a great time in La Jolla and one reason was our stay at this wonderful home. Only complaint was the noise from the road nearby during rush hour(s). Great location! Walked to beach, reastaurants. Worked well for my party. It was a pleasant stay. Nice to have parking and also very closeto restaurants and beach. We loved our stay at this sweet little casita. It was just right for our needs. We wanted a place we could park our car and walk everywhere and this was the place. We walked to all the shops, and down to La Jolla Cove several times over the visit. It was a great spot for us adults and also our 4 year old son. We did hit Trader Jos on the way into town and we wished we hadn't bought so much of our own food because there are so many wonderful eateries/bakeries close by to choose from, and they are affordable! Next time. However, if you do bring your own ready made food like from Trader Jos offers- they have a microwave, toaster, heating plate making preparation easy. The owners are very nice and quick response to my inquiries. We loved our time here, I would highly recommend. 10/10. Perfect location & Super Helpful Owners! Location in La Jolla doesn’t get much better. Patio was quiet and peaceful. Owners were beyond helpful and responsive. Place was immaculate. Great find! Thank you for choosing to stay at our Casita. We are delighted that you enjoyed your visit to La Jolla and look forward to welcoming you again soon. Rates and terms subject to change until reservation is confirmed.